In November 2013, when the sad news for the split-up of Italian folk pagan black metallers Draugr were spread, everyone was disappointed, because they had just released an amazing album and they seemed to be at their peak. Luckily, as we say in my country “ουδέν κακόν αμιγές καλού” (there is no bad without good). Very soon, 2 new amazing bands rose from Draugr’s ashes. The first one is Atavicus, formed in 2013 by Draugr’s vocalist and guitarist (Lupus Nemesis and Triumphator) and the second one is Selvans, formed in 2014 by 4 ex-Draugr members initially (now there are 2 of them in the band). 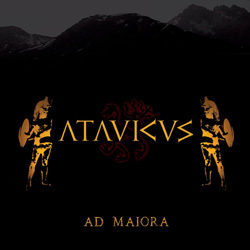 Atavicus signed immediately to the Irish label Nemeton Records and released their debut album “Ad Maiora” on November 10, 2014. Formed by the desire to perpetuate the epic stories, the traditions and the beauty of their homeland through their music, the band calls its style Italic pagan heavy metal. There are 7 tracks in “Ad Maiora“, including a short intro, an instrumental interlude and a cover on Immortal’s “Tyrants” and its total duration is almost 37 minutes. So it is actually something between full-length and EP. After the epic short atmospheric intro, the album opens with “Sempiterno“, revealing the quite aggressive intentions of the band. It is my favorite track of the album, a fast, brutal, yet melodic epic pagan black metal song, without any compromises and with a killer epic refrain. Atavicus have a raw, natural, unedited sound, where distorted guitars are combined with epic synths and extreme black metal screams are in constant dialogue with wonderful epic clean male vocals and catchy refrains. Everything sounds very powerful in the mix and guitars are cooperating perfectly with the synths. Acoustic passages inside the songs help them sound even more atmospheric and versatile, adding often a folkish touch to their music. The third track “La Disciplina dell’Acciaio” has a slower tempo and a more epic, melodic, folkloric approach in its structure. The 4-minute “Epos” is a synth-based instrumental composition, serving as an atmospheric interlude in the middle of the album. “Lucus Angitiae” is another nice example of the band’s way to combine raw epic black metal with epic synths and folk elements. The next track is the wonderful “Superbia in Proelio“, my second favorite composition of the album, balancing once again between raw aggressive pagan black metal and epic folk melodic metal in a unique way. “Ad Maiora” closes with a nice cover on “Tyrants“, which sounds different from the overall atmosphere of the album, despite the band’s effort to bring it closer to its style. It is very welcome as a “bonus” track, however. All of their lyrics are in Italian and as mentioned before, they are inspired by the local nature, history, tradition, culture and legends. Atavicus released a very good debut album and I am expecting much more from them in the future. I believe they still need a lot of work in the overall production and at the same time I hope they never alter this raw, aggressive, natural sound quality of their music, keeping all the extreme elements in their sound. ”Ad Maiora” has some brilliant moments, and tracks like ”Sempiterno” and “Superbia in Proelio” are stuck in my head. There are of course some less interesting songs too, so I am really curious to see how the band will evolve in the future and how can they handle a more complete full-length album. “Ad Maiora” is released via Nemeton records in digital format and in a limited digipak CD edition with 8-page booklet, already sold-out. They have agreed with Nemeton for a future re-release in jewel-case CD this time. Cover artwork and graphics are by Sofia “SvartSnø” Buratti, while the booklet also includes all the lyrics, except for “Tyrants“. You can follow the band’s official pages below for more details, or watch the official album teaser to get a first taste of their music.